It seems that a staple of being a child is the “me first” mentality. 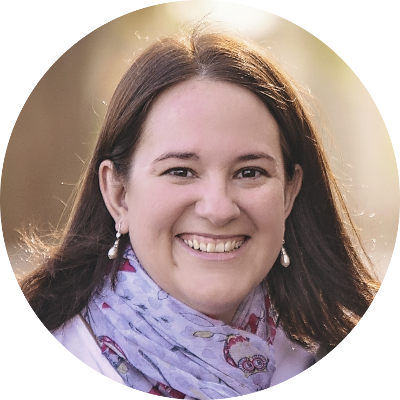 It’s something that bothers me as a mom, but as much as we try to encourage fairness in our home it still crops up. And then The Steves arrived with us, and all of a sudden I had another item in my arsenal to help me teach how petty these arguments can be sometimes and how we can laugh at them together. 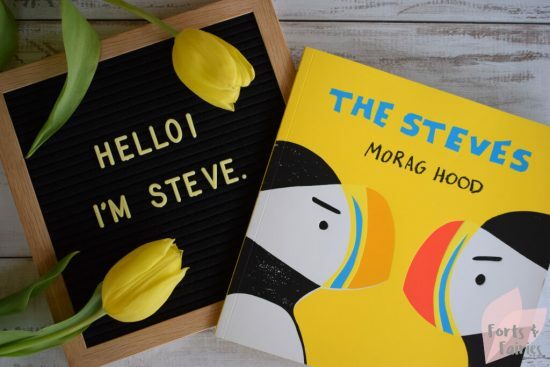 The Steves by Morag Hood became a firm favourite from the first time we read it, with its brightly coloured pages and of course the funny Steves it’s guaranteed to make you laugh every time. 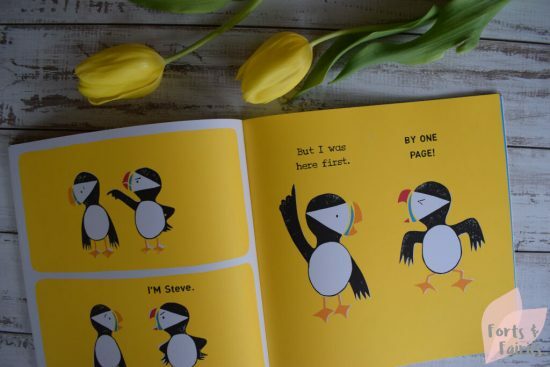 The story introduces us to a friendly looking puffin called Steve, but when we turn the page we meet another puffin called Steve. Things escalate pretty quickly, and before long the two Steves are arguing about who is Steve the First and who is Steve the Second. They present their birthdays, whose wiser, taller and how many fish can be caught as evidence. But before long things get a little more personal and feelings are hurt. The Steves realise as much and say sorry to each other before becoming friends. That is, until another Steve appears! 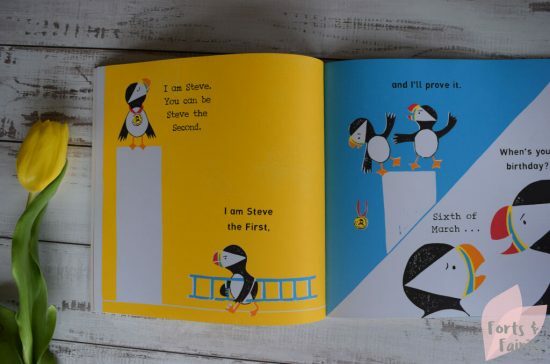 Every time we read this story we laugh, Morag Hood has captured the essence of the silly arguments children have in such a brilliant way and he’s conveyed it so well that even a young child will understand the message that The Steves is sharing. The balance between being a fun story and using this book to teach our children is struck perfectly, making this a must-have for your book shelf. The Steves is available from book stores and online retailers for a recommended retail price of R155. Thanks to Pan Macmillan for sharing The Steves with us, we are so glad that we met them! Love this. I’m getting a copy soon. That’s awesome Yolandi, I hope you enjoy reading it as much as we have!